Heard about Online Video Converter Applications? Did you knew, one can convert video online for free? Hope you know that these online video converter applications are totally free to use! I know most of you don’t know this…Just like every other person, do you spend your money in purchasing video converter software? But these online video converter apps do the same job for free. Isn’t that shocking? You know…Even the cheapest video converter software for Windows costs around $19.99. Now what if you want the same software for MacOS? You then need to purchase a copy for the same video converter, which you have already paid for. And most importantly, availability of the same video converter software from its developer can be an issue too. So what you’ll do? You’ll definitely want something; that saves your money and gets the job done, won’t you? In this article, I’ll tell you about free online video converter application that will convert videos for you efficiently. And most importantly for FREE. It won’t matter, if the video is in your computer, Google Drive, Dropbox, SkyDrive or any URL. 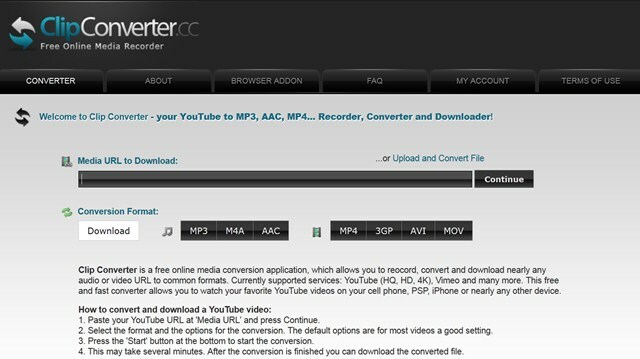 You can even convert and save youtube videos using such free online video converter applications. Few reasons why free online video converter apps have great advantage over conventional video converter software. Always Free to use – Anyone can convert video online using such apps. Easy to use User Interface – Even small kids will be able to use it. Works on any OS – These online video converters are web based application, you only need internet to access them. Hence they platform independent. So doesn’t matter if you use Windows, MacOS or Linux. One with any OS can convert videos online for free. Saves your money – Since these online video converter apps are free, they keep your wallet intact. Isn’t that great? How to Convert Video Online using Online Video Converter? There are several websites which will help you. Depending on type of videos you want to convert or your technical skills, I’ll suggest websites for you. So if you just want to convert and download Youtube videos, there’s a different website. Or you want to you convert videos from your PC, there’s a different website. And if you want to have full control of how your converted video looks, I’ll suggest a different website. Clipconverter.cc is one of the best sites to download Youtube Videos. And the best part is, you can convert Youtube Videos on the fly. Later you can download the converted video too. In this tutorial I’ll be using Apple’s Ipad Air 2014 Commercial as a sample video. Ok! so now, what we’re gonna do is; Use the video URL to convert and download it on PC. Step 1: Copy URL of Youtube Video, paste it in Clipconverter.cc and Click on ‘Continue‘. 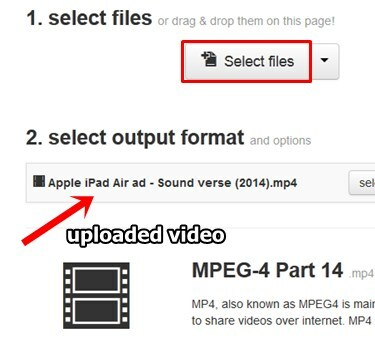 Step 2: Select the video format you want the Youtube video to be converted to. I’ll select ‘.MOV‘ format so as to use in QuickTime Player. Step 3: Click the ‘Start‘ button, to start the conversion. Conversion might take 5-10 second and later you can download the converted video. As you can see, it took 9 seconds to convert the video (see screenshot above). Clipconverter.cc is defintely great if you want to convert Youtube videos to other video or audio formats, without technical mumbo jumbo. Not only it can convert Youtube Videos, it can convert files from Dailymotion, Google Video, Sevenspace, Vimeo, Metacafe, MyVideo, Veoh and audio from Soundcloud. Usually, most videos we convert are from our computer. And there’s a cool online video converter which just might help you. It is BenderConverter.com, lets consider you have Full-HD video. Now you want to convert it, so it could run smoothly on iPhone or Android device, without hogging much space. Consider BenderConverter.com to your rescue. Step 1: Upload video by using the ‘Browse‘ button. Step 2: Select video format, you want to convert the video to. Step 3: Now click on ‘Convert‘ button. This will upload the video file and convert it. After conversion, you can download the converted video for free. Enjoy! Till now, we saw online video converter that had no advanced options. Options that are mostly featured in premium video converter software. To tell the truth, 90% of people never use these advanced options. Now for the 10% who do. Here’s an online video converter for you. Here’s the real meat of this article. This is the one thing, that I was desperate to reveal to you guys. 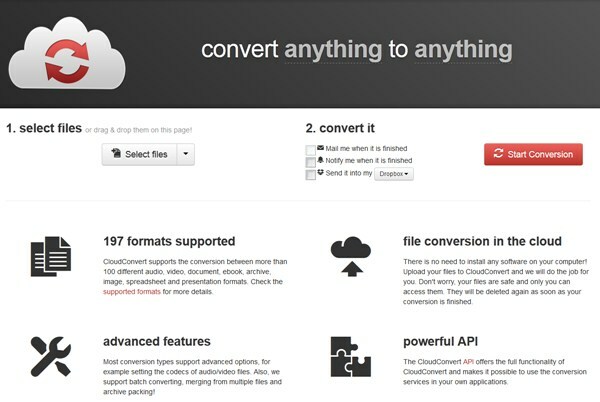 This online video converter is known as CloudConvert.org. It’s still in beta state but can give any premium video converter a run for its money. Yeah! Step 1: Click on ‘Select Files‘ button to upload your video. Step 2: Select the video and make some advanced settings. Refer the screen cast below. The settings I made here are perfect for my smartphone Micromax Canvas A110. Step 3: After making proper settings, as per your choice. 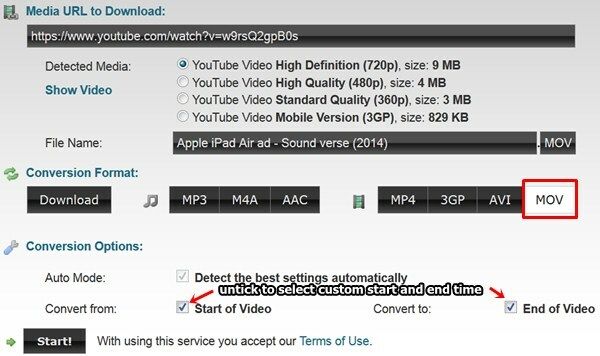 Click on ‘Start Conversion‘ to upload, convert and later download the video. You can even set notifications or send your converted video directly to Dropbox or Google Drive. Though the ‘Mail to me when it (video after conversion) is finished‘ checkbox doesn’t works. For me, online video converter apps does excellent job to convert video online. Though these video converters have so many things going for them. They even have some cons too. And being an honest writer, I definitely have to disclose them to you. Drawbacks of Online Video Converter Applications. Totally Internet Based Apps: This is the most legitimate drawback of these video converter apps. Without Internet they are of no use. If your Internet is down and you want to convert a video immediately, you really can’t do that. This is the reason why Google’s Chromebook too failed. Uploading time: This is the biggest drawback of these applications. Videos need to uploaded before you can convert them. The video I used as a sample was about 9MB. This took about 1 minute to upload on a 1Mbps connection. So higher the video size, more time is required. And time is money baby! No Video Storage Option: Once a video is converted and available for download. The original video is deleted. If you’re not satisfied with the converted video. You again have to upload the video all over again. This can get irritating. No preview before Download Option: Just like you won’t buy a car without test drive. Similarly how can you download a converted video without previewing it. Online video converter do not offer this service. Consider you upload a 50MB video and after conversion, downloaded the same video of same size. This can take a total time of about 10 Minutes on 1Mbps connection. Now if you’re not happy with the converted video, your 10 minutes literally got wasted. I will create another article about free video converter softwares for Windows. So if you want to convert huge video files like music video, seminars or movies, you can do that. Be tuned for it. Are you going to start using online video converter? I’d suggest you do. For kids and college kids who can’t afford premium video converter software. This is really a boon. But still it all comes down to you. The choice is totally yours. Share this article on popular social networking sites like Facebook, Twitter and Google+. Even sharing on one site will be enough! We as writers spend a lot of time in coming up with articles that will help loyal readers like you. And your one share can pay off the price. Am I begging for too much? So that people know, what miracle they can do on the Internet. You guys are awesome. Keep rocking! peoples should use these tips to save time and money. really good information for video addicted peoples! Yeah! It is Lynee… Thanks for reading this article and taking time to leave a comment. Appreciate it a lot. Nice tips there.. Video converters are so helpful.. This solved the problem from installing hectic unwanted converters on computer. Its cool seeing how Clipconverter works. Every video marketer should at learn of the basics of video converter software. There are many of such tools but it is important to apply the tool that works better. Every tool has its functions and features but what matters at the end is the ability to use them. I use Total Video Converter software and it has been wonderful. I hope other users will find the tools described here useful! This article of yours is indeed helpful and technical. Well, I’m glad that there is actually an existing online video converter that is totally free. This app that you’ve introduced will surely help many marketers out there, who want to be practical nowadays. Why purchase $20 dollar video converter if there’s free, which can perform just as like as the paid one? As what you’ve said, there is a big advantage in using free online video converter. Aside from it saves you money, it is also handy and convenient to use. The steps you’ve shared on how to get started in converting videos online using online video converter are helpful. I’ve always had trouble downloading YouTube videos. I like to download them so I can watch them later, on another device on my Ipod. I’ve gone through so many add-ons for chrome, but seems like they always stop working. So you solution is perfect. I’ve recently been browsing for an effective, free video converter online last day and am glad I’ve found this blog post. The steps you’ve shared on how to convert videos through this free video converter is indeed useful, especially for those marketers who want to be more practical nowadays and are finding a convenient way to save their budget. Anyway, I’ve found this post shared on Kingged.com and leave the same comment there. Thanks for this great article, the Clipconverter.cc website is awesome. After reading this post I used it for around 30 mins to download few of my favorite songs. Thanks for sharing such awesome resources with us!